Toy Runs at SQ and DVI! Motorcycles lined up outside the San Quentin and DVI Visitor Centers to bring some cheer to our youngest visitors! Black Sheep of Livermore rode in to DVI late November and brought many toys for visitors. Hatt’s Motorcycles came to visit San Quentin last weekend with two VW buses filled with goodies! We want to thank everyone who donated and participated to make the events a success! Converse with children about My Pyramid. Ask them what they see! What types of food go with each group? What do the stairs represent? Preschoolers love bright colors and group participation. With an on-going project, they can see what their peers before them have charted. They gain an understanding about healthy body habits such as a balanced diet and exercise. Aside from the nutrition aspect, this is an opportunity for math skills. They will analyze information presented on a chart, conceptualize a complex item as a whole and then as parts, understand symbols, and use thinking skills to categorize. The CDC created this campaign to raise awareness through a popular concept. The point is that ANY sort of emergency situation could arise and each household should have a plan on hand (just as each VC does). The goal is for a family to create and practice the plan together. How do you know someone is listening to you? How does it make you feel when you feel listened to? How do you know when someone isn’t listening to you? How does it make you feel when you aren’t listened to? Children will recognize active listening skills, which will improve communication skills with others. Celebrate Dia de Los Muertos with Us! 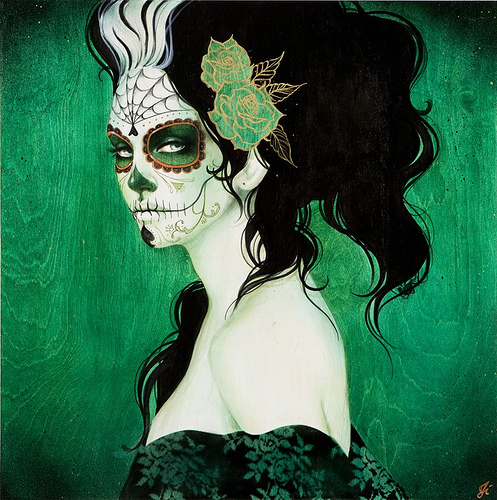 Dia de Los Muertos, Day of the Dead, is a Mexican celebration which originated with the Aztecs over 2,500 years ago. Here in the US, death is often a somber subject whereas in other cultures, death is a more accepted part of life; people mourn while remembering family and friends who have departed. Originally, Dia de Los Muertos was a month long celebration which was reshaped during the Spanish invasion. More recently, people celebrate with ofrendas, offerings of bread, trinkets, sugar skulls, and orange marigolds (referred to as the “flower of the dead”), wear sugar skull or other face masks, and showcase the culture in honor of their loved ones. This year, we join with Fathers and Families of San Joaquin to celebrate Dia de Los Muertos in a community wide healing and cultural ceremony. Dancers and storytellers will provide entertainment and food is provided! For more information, see this post. If you are unable to make it and want to celebrate your own Dia de Los Muertos, check out this link for children’s activities and more! Friends Outside joins Fathers & Families Coalition of San Joaquin County in support of community healing and cultural recognition at the Dia De Los Muertos ceremony November 2nd, 2011. • Honor and recognize those who have lost their lives to violence. • Create a space for healing and recovery from violence. • Take a community wide stand for peace. The ceremony will begin with a blessing at 4:00 PM at the Catholic Cemetery located on 719 Harding Way Stockton, CA 95205. 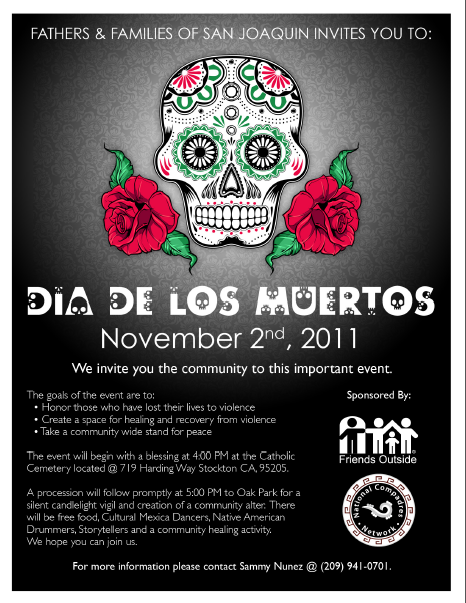 A procession will follow promptly at 5PM to Oak Park for a silent candlelight vigil and creation of a community alter. There will be free food, Cultural Dancers, Native American Drummers, Storytellers and a community healing activity. Please feel free to disseminate widely! For additional information please call Samuel Nuñez at (209) 941-0701 or by email at snunez@ffsj.org. So be a hummingbird…Take that first step. Your contribution can change a whole life, including your own. Take a moment to view the video…You won’t be disappointed. As you’ve seen lately, car seat expiration dates are quite a buzz. You might be wondering why this issue has come to the forefront suddenly, when expiration dates were a non-issue before. Let’s set something straight…Everything has an expiration date, whether it is stamped with one or not. Fresh flowers wilt in a matter of days and pictures yellow over the years; even Twinkies only have a shelf life of 25 days! The point being, things change and erode over time. I remember a time when I was 8 and I learned a hard lesson: don’t leave your MC Hammer Can’t Touch This tape in the car during the month of June. Why? Because it warped and cracked. Think about car seats; they are made completely of plastic and fabric, two things that break down in the UV rays. Not only can the plastic become so brittle that it shatters and the Styrofoam so degraded that it doesn’t protect upon impact, but best practice and regulations change frequently, meaning that seat may become obsolete. Wondering what the expiration of your seat it? Expiration and/or manufacture dates can be found on the bottom of the seat or in the owner’s manual. If you can’t find an expiration date, check for a manufacture date. Most car seats have a maximum life of 5 years, though calling the manufacturer is the best way to find out what their schedule is. All-in-one car seats can be a danger here, as children should be in boosters more than 5 years. Keep that in mind the next time you look at convertible car seats. It’s also important to replace seats after an impact. Seats can become damaged during an accident due to force. California law requires insurance companies to replace seats that have been in accidents, regardless of age of the seat. 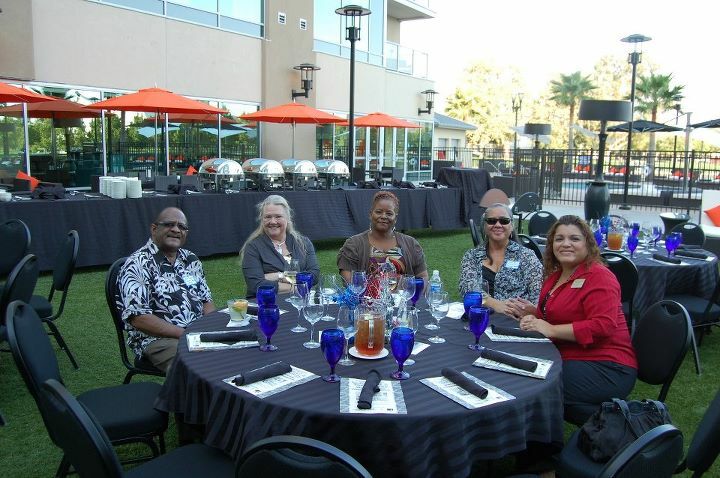 Last week, we had the chance to meet and greet with the local Stockton community at the Industrial and Technology BBQ. This annual event, hosted by the Greater Stockton Chamber of Commerce, is a chance for local agencies and business owners to mingle. Thank you to the Chamber of Commerce and the University Plaza Waterfront Hotel for this wonderful event! Look at you smiling; you must be happy! Engaging infants in talk about themselves and others not only increases communication skills (such as responding to verbal cues, identifying a home language, and the act of communicating through words and actions) but helps them learn about themselves (feeling valued and attached to others and being competent and proud), their feelings (communicating through gestures, sounds, and words in an appropriate manner), and about others (developing trust and interest and care and cooperation with others). Parents also stand to gain more understanding about how their infant communicates and confidence in the emotional growth of their child. Child will have a piece of work caregivers can identify with and talk to their child about (source of pride). This activity can be completed as a group or alone! What about their facial features tells you how they are feeling? How does it make you feel when people smile at you? Children learn to recognize visual cues of emotion in people. Sharing and talking about the pictures provides additional insight from others. We know the key to learning is to engage caregivers in their child’s development. When caregivers are in the center with their children, we invite them to join in the activities. Please share these activities with anyone who may benefit from them! Childhood should be a time of fun, warmth, security, exploring, learning and discovery. Children with an incarcerated parent may experience stress, anxiety, and fear. Their lives have been disrupted; many feel as if they do not live “normal” lives. For some children this will be the first holiday season without their parent; for some it will be one in a long series of lonely holidays. Friends Outside knows we cannot fix all issues related to having an incarcerated parent but at the very least, we can brighten the holidays for a few lonely children. In 2010, our sponsors brightened the holiday season for over 100 children. The Holiday Wish Program offers organizations and individuals an opportunity to bring some “normalcy” to a child’s life during the holidays. We nurture, support, bring joy, and give hope to children of incarcerated parents by providing gifts and the knowledge that someone cares. If you or your organization are interested in sponsoring a family and brightening the holidays with food and gifts, please contact Maria T. Rocero at 209-955-0701 or mrocero@friendsoutside.org for more information or complete the Sponsor Form and return via mail, email, or fax. Children’s Activities…A Hands on Experience! Enter your email address to subscribe to Friends Outside and receive notifications of new posts by email.